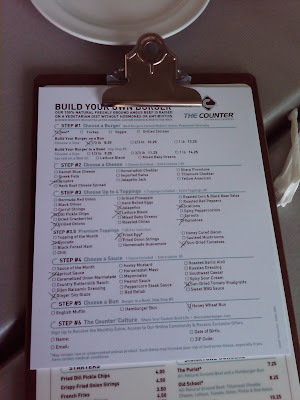 If you have not heard of it yet, The Counter is a new Burger restaurant concept where you are in control of your meal. Basically, they have a tong of options and fresh ingredients and you choose to custom make your burger exactly the way you like it. According to their website, there are over 312,120+ different burger combinations for you to choose from. 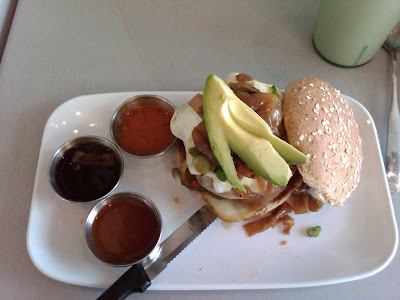 Though, for those that are not too picky, they do have signature burgers and sandwiches where you do not customize it. The Counter's newest location will be opening in Ballard on Monday, September 21. To help the staff get more comfortable with serving, the menu, how the restaurant runs, etc, The Counter arranged to have people come in to test out the newest location - for free! Well, everyone loves a free meal - so I was in! When we sat down our waitress was very friendly and told us how it works, about the meat & toppings and how to fill out our card. OK, I LOVE the card idea because I am a picky eater and a visual person and I like to see what toppings/sauces/cheeses are available. As a picky eater, I can write notes next to my checked items like, on the side please. That was my custom burger card today! You can choose beef, turkey, veggie or chicken in either 1/3lb, 2/3lb or a 1 pounder! The portions are pretty big and are weighed AFTER cooking. As you can see I added tons of toppings. 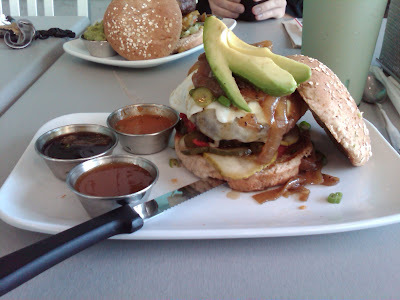 In addition to the normal toppings (mixed greens, tomato, onion, tomato, etc) I ordered pickle, jalapeno, scallions, avacado, sun dried tomato and fried egg. What especially excited me was the fact I can put an egg on my burger! All burgers should come with a fried egg, and let me tell you it was cooked perfectly! I also choose the apricot sauce which was amazing. I almost chose an english muffin as my bun, but went with the honey wheat. They also offer a "burger salad" which is bun-less. I will have to try that. 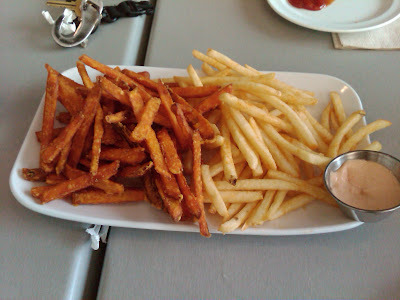 We also ordered french fries, 1/2 regular fries and 1/2 sweet potato fries. They were really good and I think I actually prefer the sweet potato fries. Also, a big portion. Because the burgers are customized, they take a little bit to cook, especially if you get the 2/3 or 1 pounder. Actually, we were told the 1 pounder takes about 30 mins to cook - that is how big it is! The burger was really big, really good and really messy. The ingredients were fresh, the burger was cooked perfectly and that egg yolk broke and I was in burger heaven. Also, I love juicy burgers and this one was juicy. I ordered the 1/3 pound and I was overly full and did not even finish my last bite. Prices you might be wondering? Well, actually, their prices are pretty reasonable. A 1/3 burger is 8.50 and comes with 1 cheese, 4 toppings, and 1 sauce. You can add additional toppings for $.50-$1.00 each, depending on topping. In addition to burgers they have a full menu featuring appetizers like fried pickles, chili, salads, milk shakes, soda floats and desserts like key lime pie or apple crumble. They also have wines and beers, if you so choose. I had the chocolate shake and it was thick and topped with fresh creamy whipped cream - yum. They have an Apple Pie shake that I think I would try.